Welcome back to our Architectural Blog Series, where we highlight some of the great work done by Parkin. Today on the blog, we take a look at the consolidation of all University Health Network breast-cancer clinical services and upgrades made at Princess Margaret Hospital in Toronto. Princess Margaret Hospital is known for its ability to balance state-of-the-art diagnosis and treatment with compassion and care. The breast-imaging area needed to be reconfigured in order to accommodate the installation of new digital mammography machines. The objective for this project was to recognize patient and staff requirements by upgrading the care environment to meet everyone’s needs. The meticulousness of the clinical environment required us to maintain and improve upon what was already in place. 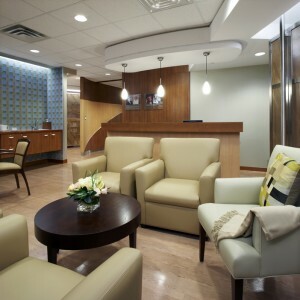 The technical purpose of the renovation was to create high-quality clinical spaces, and improve access to patients and staff from a central space. Renovated areas are located off an existing atrium consisting of two areas for clinical space and another area for the Survivorship and Education programs. These spaces combine public and private activity. Important design elements from the patient care perspective include facility identity, patient privacy, and easy navigation. A highly visible separate entrance was created for the Survivorship Clinic, a patient support and an after-care program for long-term monitoring, education, and counselling. As a space for both patients and their families to continue the healing process, the Survivorship Clinic was designed with a patient-friendly focus. To do so, meticulous care was taken in selecting materials and treatments that maintained the facility’s clinical standards. This was accomplished with the use of wood-grain sheet flooring, porcelain stone tiles, and frosted glass. In addition to being durable and easy to clean, the space creates a natural privacy and soothing interaction between the hospital and patient. 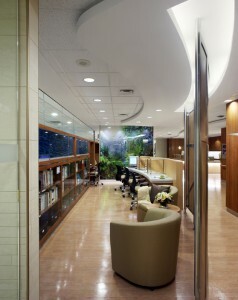 The centre’s design strengths lie in the successful balance of aesthetic warmth and clinical functionality. Key personnel and technologies are placed in consistent, correct relationships. Princess Margaret Hospital institutes high standards of care for their patients, and staff, and sets comparable expectations for their architects, making this a truly collaborative design process.